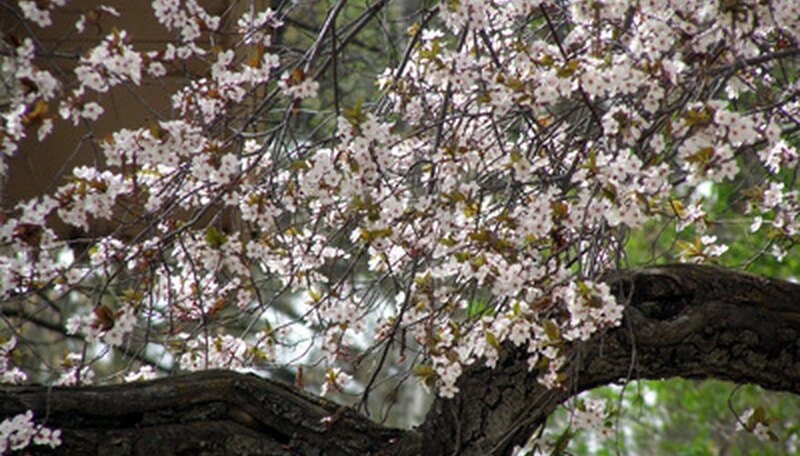 Kwanzan cherry trees are landscaping trees with double-pink flowers and an attractive, upward-reaching shape. They are usually planted for these two features, despite the fact that they are not hardy or stress-resistant, and are prone to a wide variety of diseases and infections. Given that your Kwanzan cherry tree has a delicate disposition, keep an eye on it to prevent unwanted infections and death. Cherry scales are caused by small infestations of insects that feed on the tree and secrete a sweet, gooey substance that ants, molds and mildews find attractive. It is likely that the first sign of trouble you may see is the secondary infection of mold or mildew if the scale insects have not matured and become visible as brown nodules on the branches and twigs of the tree. You may also notice that leaves or flowers are wilting. Since these insects are difficult to spot, they generally require treatment with an insecticide. However, if your cherry has already flowered, you may need to wait until after the harvest--simply pruning affected parts wherever you spot them--to avoid destroying your fruit crop. Leaf spot in Kwanzan cherry trees is caused by a bacterial infection. The spots may be black, brown or orange. Left untreated, the affected areas will rot away completely, leaving "shot-holes" in the leaves, which will eventually fall off. You can prevent the spread of leaf spot through sterile pruning, wiping your clippers with rubbing alcohol after each snip, and by removing all diseased debris from the area around the tree. Fertilize the infected tree with a comprehensive fertilizer to help the tree fight off infection. Kwanzan cherries must have well-drained soil and plenty of sunlight or they will develop a variety of mold- and mildew-related afflictions. The most severe is root rot, caused by the fungus phytophthora, which rots the roots of the tree and prevents it from taking up water, effectively killing it. Root rot cannot be reversed and the tree should be removed as quickly as possible to prevent the spread of infection. Powdery mildew and mold, on the other hand, appear as black, gray or white fuzzy coverings on the tree. You can control these by simply pruning off the affected parts of the tree, or by applying sulfur if the harvest is already past.